Serim® GUARDIAN™ Water Hardness Test Strips give a semi-quantitative indication of the level of hardness in water. Hardness is used to describe the total concentration of calcium and magnesium ions, expressed as ppm (or grains per gallon) of calcium carbonate, CaCO3. Hard water can adversely affect the dialysis patient as well as damage the water purification equipment. In general, water treatment system manufacturers recommend that the hardness of water entering the RO filter should no exceed 10 ppm of calcium carbonate1. 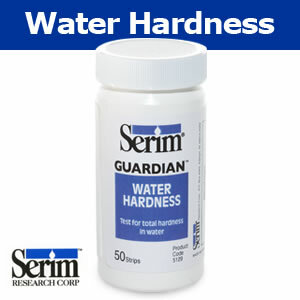 Serim® GUARDIAN™ Water Hardness Test Strips give a semi-quantitative indication of the level of hardness in water. Hardness is used to describe the total concentration of calcium and magnesium ions, expressed as ppm (or grains per gallon) of calcium carbonate, CaCO. Hard water can adversely affect the dialysis patient as well as damage the water purification equipment. In general, water treatment system manufacturers recommend that the hardness of water entering the RO filter should not exceed 10 ppm of calcium carbonate1. Test a sample of water at the post-softener stage of the water treatment process to make sure that the softener is removing calcium and magnesium. Sample Collect water sample in a clean container. Open valve and allow water to run out in a slow, steady stream. Test Strip Technique Immerse indicator pad into water sample for 1 second. Insert indicator pad into stream of water for 1 second. Results Compare the color of the indicator pad to the color blocks on the bottle label 10 seconds after immersion of the pad. Immediately compare the color of the indicator pad to the color blocks on the bottle label. Store bottles of Serim GUARDIAN Water Hardness Test Strips at temperatures between 15°- 30°C (59°- 86°F).